WWE Hall of Famer Shawn Michaels hung up the tights for good eight years ago in a style befitting one of the greatest workers to ever step inside a wrestling ring. His last match was at Wrestlemania 26 in 2010, on a big stage which he had helped make even bigger over the years, and against an opponent who had never been beaten on that same grand stage. The Heartbreak Kid lost a “Streak vs. Career” match to The Undertaker in a Wrestlemania classic, but one that would be surely remembered even more for being the final match of Michaels’ illustrious career. For the most part, retirement matches in pro wrestling have meant little more than a reason to enhance a storyline and a draw a big gate, only to have the defeated warrior return at some point and draw more money with a comeback tour. Michaels, though, had been adamant about not returning like so many others had before him, including Ric Flair, who had been retired by HBK himself at the 2008 Wrestlemania but eventually returned. And unlike most wrestlers before him, Michaels had stayed true to his word. Talks of a Shawn Michaels return have been surfacing since Michaels retired in 2010. Rumblings grew louder in 2017 when Michaels was asked by WWE to end his retirement for a bout with AJ Styles. Michaels meant every word he said. He enjoyed spending time with his family on his ranch in Texas and hunting in the wild outdoors. There wasn’t much more he could possibly accomplish in the wrestling business. His legacy was intact. This year, however, something changed. After taking a choke slam from The Undertaker through the announce table at WWE’s Super Show-Down stadium show last weekend in Sydney, Australia, Michaels appeared two nights later in Chicago on Monday Night Raw. He and longtime friend Triple H confirmed what many already had figured out. HBK was back in business. Michaels will end his eight-year hiatus to return to the ring alongside Triple H and take on the team of The Undertaker and Kane at WWE’s Crown Jewel pay-per-view event Nov. 2 in Saudi Arabia’s capital city of Riyadh. “Eight and a half long years that I have sat there and honored my word out of respect, a respect that never existed at all,” said Michaels before confirming the return of D-Generation X and his own in-ring return. Financially, the offer reportedly was bigger than a Wrestlemania payoff, largely due to a long-term partnership between WWE and the Saudis. For Michaels, the offer apparently was one he couldn’t refuse. Many fans still fondly remember his 14-minute retirement speech eight years ago. His final words were the same ones he used when he had first turned heel 18 years earlier. His speech was heartfelt and emotional. It felt real, and fans believed. Perhaps Michaels himself believed. But then again, wrestlers never really retire. In this case, more than anything else, the money offer was just too good to turn down. There are major international markets where WWE wants to put its best forward. And what better way to make an impression than to bring The Undertaker (age 53) and Triple H (49) back for one “final” match, get Michaels (53) involved, and throw Kane (51) into the mix for good measure. That’s a lot of nostalgia and star power. That’s also why some fans might feel let down now as Michaels goes for another run. And his return isn’t coming at a Wrestlemania. It’s happening in another part of the world. To his credit, Michaels had turned down an offer to work WWE’s show earlier this year in Saudi Arabia. But not this time. Fan reaction was mixed on social media. “I love Shawn Michaels perhaps more than a grown man should. I adored him growing up and thought his retirement was so special and perfect. As much as I miss him in the ring, I really do not want him to return for this tag match in Saudi Arabia,” tweeted one fan. “DX is still more over than anybody on the current roster,” posted another. Is there reason enough to sour Shawn Michaels’ retirement story? Less than two years ago Michaels told podcaster Sam Roberts that he wouldn’t return just for a big payoff. He had resisted the temptation for nearly a decade. The inaugural show of the controversial WWE-Saudi partnership in April was peppered with propaganda from a repressive government which, by the way, bans female competitors but boasts the country’s progressive nature. Saudi officials were forced to apologize for even showing female stars during an advertisement shown on a big screen inside the stadium. WWE reportedly was paid a staggering $50 million for the event last spring. The company, whose lucrative deal gives it a long-term foothold in this region of the world, is getting top dollar for its biggest stars to perform on those shows. Attempting to soften the blow, Triple H (Paul Levesque) later said that he hoped WWE would be at the forefront of changing attitudes in that kingdom, with hopes that progress would be made over time. With recent developments, though, WWE could come under greater scrutiny over its relationship with the Saudis. Reports that a missing journalist and prominent critic of the Middle Eastern regime may have been killed by Saudi intelligence officers in the Saudis’ consulate in Turkey have only heightened the tension and put the spotlight on the Saudi government. WWE fans also have taken to social media to express their views. “It’s time for the WWE to show some guts and cancel the show in Saudi Arabia,” posted another. WWE may have to decide at some point whether the money is worth the relationship. Michaels has kept in great shape during his extended time off. Most recently he has been working as a trainer at the WWE Performance Center where he has been in the ring with young talent on the roster and those hoping to make the big leagues. While he’s no longer at the level he was when he retired at age 45, Michaels is still more than capable of creating some memorable magic in the ring. But it’s highly unlikely that Michaels’ return will end with one match in Saudi Arabia. WWE reportedly is building toward a Michaels-Undertaker match next year at Wrestlemania 35. If that happens, it’s likely that Michaels could work a series of bouts building the program. Michaels had once suggested that working another big match and trying to emulate “The Showstopper” could only damage the perfect picture and sendoff he created with The Undertaker. “I’ve never done a perfect thing, I think, in my life. But I am at least wise enough to know those things that I’ve done that shouldn’t be messed with,” he said in a WWE Network interview. Will this comeback be one for the ages? 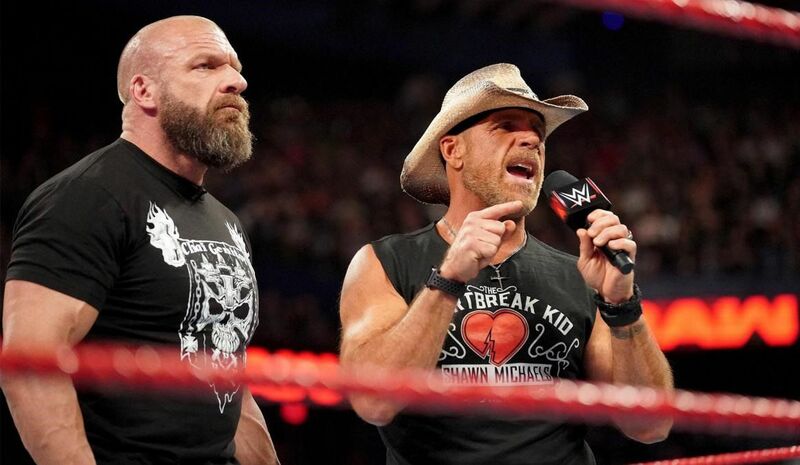 Can HBK defy time, or will his return tarnish the image of one of wrestling’s greatest superstars?